I think you will all find this a bit different - it is for Børge. It is plain vanilla but with a "slightly" different layout - I've been thinking about a layout like this for over a year. Nothing beyond pointing pairs and hidden singles. No single part solves but the solution space is quite restrained, so it all works together. Improvements on the name welcome. This looks interesting, but I'm having trouble figuring out just what the constraints are (other than the dotted lines). Can you help me out here? 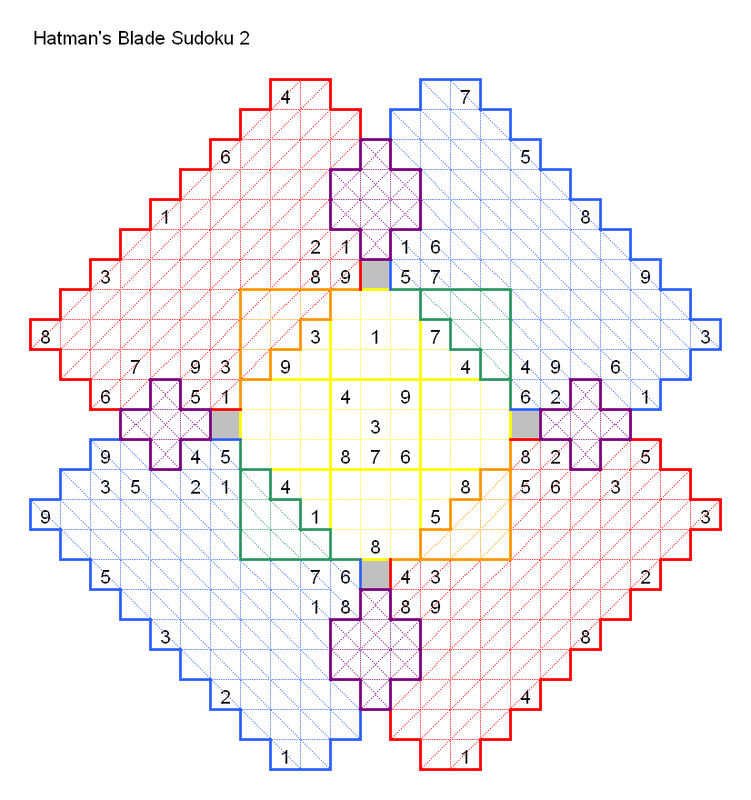 The centre is a plain vanilla sudoku. The outer Blades have no nonets, horizontals cannot repeat, verticals cannot repeat and the marked diagonals cannot repeat. the other diagonals can (and often do) repeat. The eight overlapping areas make it a very restrained puzzle. Thanks for the links. The colored diagram makes it a little easier to understand. I'm going to have to spend some time to wrap my brain around this one before I tackle it. And I assume none of the software helpers can import it to make candidates for me? I do not have codes for any of the fairy ones as I do them as groups of JSudoku. As they are non-standard I'm not sure how to do anymore than five strings of code? For this one I used 5 JSudoku a normal one in the middle and 13*13 without nonets for the blades it akes a bit of fiddling about to remove 10-13 but once you have it you can reflect horizontally and vertically to get the others. I managed to recreate the puzzle in Excel (wish I'd had Nikoli_freak's Excel file instead of just a jpeg), and then I separated the component puzzles. I just wish I had some way to get the candidates done for me for the blades--I tend to make mistakes on the candidates and mess up the puzzle before I even try to solve it. Frustrating, and takes the fun out of it. The link now returns a "(404) PAGE NOT FOUND". Thanks for the links. The colored diagram makes it a little easier to understand. enxio27, can you please post the colored diagram here.